Prevent clogged and overflowing gutters with gutter guards installed by Custom Built. No homeowner likes dealing with clogged gutters. Besides being a nuisance, gutter clogs can cause overflows which can lead to attic leaks and basement flooding as well as damage to siding, fascia boards, decks, and patios. If you have wood siding, sheathing, or trim then overflows caused by clogged gutters can also cause wood rot, forcing costly repairs. Luckily, many of these problems can be avoided with the installation of quality gutter guards from MasterShield and Custom Built can install the MasterShield gutter guards that you need. MasterShield gutter guards are a protective covering placed over the gutter that allows water to enter but blocks leaves, twigs, and other debris. Installing gutter guards is a "once-and-done" upgrade that will protect your home from all kinds of moisture damage. MasterShield gutter guards, in particular, are pretty much maintenance free thanks to their use of advanced gutter protection technology. If you're interested in gutter guard installation for your home, call us today at 1-844-906-0993 or contact us online to get started with an inspection and estimate. We offer free estimates on all our services in Guilderland, Latham, Cohoes, Delmar, Slingerlands, Coeymans, Watervliet and the nearby areas. How do I decide which gutter guard will be best for my home? Will the gutter guard filter out all kinds of materials? Generally, gutter guards will keep all but the smallest debris out of your gutter, though some screen or mesh-type gutter covers won't prevent small particles like plant seeds & granules from your roof shingles from accumulating in your gutters. Thankfully, this is not generally an issue with MasterShield. 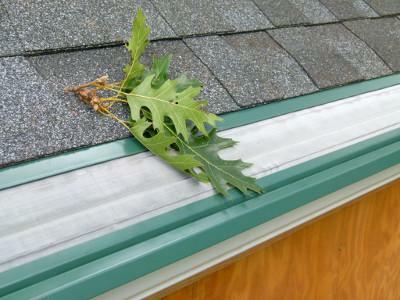 Can leaves accumulate on top of the gutter cover and block water drainage into the gutter? This can be a problem with many screen-type gutter covers, but MasterShield gutter guards use a more advanced filter design which prevents this issue. Can the gutter cover come loose or be damaged easily? Like any other exterior part of your house, there is always the chance your gutters can be damaged by Mother Nature. However, this is very unlikely with MasterShield gutter guards which are durable and long-lasting under normal weather patterns. As you can see, we prefer MasterShield here at Custom Built as it can address most common gutter guard problems with ease. Keep your home safe by installing MasterShield gutter guards today! Do your gutters frequently clog or need to be cleaned? There's no better way to prevent this than with quality gutter guards installed by Custom Built. We choose MasterShield for its use of advanced technology to avoid many of the common issues that afflict other types of gutter guards. Here at [company] we can not just provide the gutter guards that you need, but also the installation that you need for them to last. If you're interested in gutter guard installation for your home, call us today at 1-844-906-0993 or contact us online to get started. We offer free estimates on all our work in Albany, Colonie, Troy, Glenmont, Selkirk, Ravena, Westerlo, Berne, Knox, Voorheesville and the nearby areas.